My Cocker Spaniel Won't Come Back To Me! 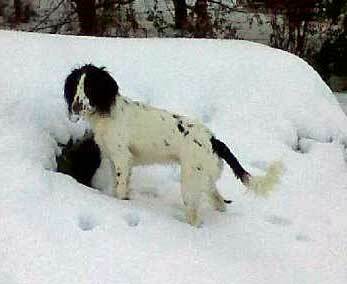 This beautiful cocker spaniel loves the snow, but always comes back when called. When I take my Cocker Spaniel to my local park and let him off the lead, he will never come back to me when I call him. I end up going all around the park to try and get him back to put his lead back on. He is 15 months old and very intelligent and so lovable, and the only problem I have with him is getting him to return to me on command. At the moment, I am scared to let him off the lead, as it takes me ages to get him back. I have to say, he loves being free to play with all the other dogs, but as I say it's a job to get him to return to me. I will be most grateful for any advice you can give me. Where am I going wrong? I fully sympathise with you on this one, however, as I'm sure you're aware, it's vital that your dog learns to respond to your recall as soon as you issue the command. And, in a serious situation, responding to it could be the difference between life and death - let's hope not, eh? I recommend you re-teach him this command; start again from scratch. You'll find the article on teaching your puppy the recall command here. The recommendation below is spot on - lots of practice until your dog responds first time. Don't forget to continue practising when you're out on walks so that he doesn't become rusty - keep him on his toes. Comments for My Cocker Spaniel Won't Come Back To Me! My spaniel cross only comes back when she feels like it. My collie/spaniel cross is 2 yrs old. We rescued her at 18 months old. When she's let off the lead, she likes to wander off into the hedges and woods chasing birds and squirrels. When I call her back she completely ignores me. She always returns after a couple of minutes but if she was to see anyone during that time, she barks at them and has been known to nip. I feel that the use of a muzzle may be the only answer. My Cocker KC was 3 when I got her and had lived in a back yard 10 feet by 12 feet. I Live in the country and walked her down the park and lake which she had never seen in her sad little life. One day I let her off lead. I then spent till dark chasing, screaming, cussing, pleading, threatening, embarrassing myself in front of dozens of dog walkers who thought it amusing as they walked their well behaved doggies. As darkness fell and with panic in my mind as I caught occasional glimpses of her in bushes, and darting here and there in all directions, I swore I would never ever own another dog and that KC was headed for a new home when caught. I never dreamt a dog like a cocker could run so fast and for such distances. Finally she trotted back panting, proud of herself and totally oblivious to my disheveled state. I was told this by a greta friend and it worked. I was told to walk away. Go the other direction or start walking back to the car or home. Ignore them, don't look back or make it obvious you were looking back. Simply call their name out loud and walk away. Next time I let her of, off she ran. I waited 10 minutes while she raced 100 miles an hour hundreds of yards away, then yelled to her and her name, turned and walked of the other way. She stopped and watched me from 200 yards away and came running after me. From then on I simply started walking the other way each time and realized that no matter where she went she was actually keeping an eye on ME even tough she never showed it. Over time the joy and excitement of freedom become fixed as a permanent thing and she learnt she was going every day so settled down over time. The other trick at the beginning is if they run off, try laying on the ground like you are hurt. Lay motionless and peek and they do come looking. My 1 year cocker spaniel comes back to me sometimes but when he sees another dog he runs to the other dogs to play. He does know his recall, but only when he chooses to! Perhaps you should try teaching him the recall command from scratch. It sounds like he didn't really 'get it' the first time, or it wasn't reinforced enough for him to respond quickly and on the first request. I think the instructions for the recall command are on the 'How To Train Your Puppy' tab. My advice would be practice, practice and practice some more.